According to Safehouse: In Laramie County, one in every four women report that they are or have been the target of domestic violence. That's a shocking 21st-century statistic for the largest county in The Equality State, one that houses the State Capitol in Cheyenne where our legislators convene annually to discuss issues important to its citizens. If this isn't a pressing issue, I don't know what is. Sometimes it helps to see a visual. Local artist Forrest King has done that for us. He's been working for months on his "Battered Bride" painting. As it nears completion (see above), he will exhibit it Thursday (today), Oct. 6, 4-7 p.m., at Safehouse's "Would You Walk in Her Shoes?" fund-raiser and consciousness-raiser for Safehouse at the Historic Depot in Cheyenne. You can see a series of photos documenting Forrest's "Battered Bride" project on Facebook. Come down to the Depot this afternoon. Walk around in "her" shoes for a few minutes. And then contribute to Safehouse, write a letter to the ed (and your state legislator), practice nonviolence in your own life. thank you for sharing these thoughts and the very dramatic visual! i hope the finished painting is not too much different from what you displayed. 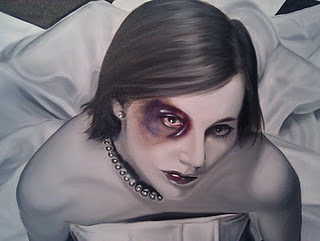 it is very effective in relating the sad reality of domestic violence.